MOUNT MCKINLEY, DENALI - WHICH ONE IS IT? Everywhere you look, you&apos;ll see references to Mount McKinley and also Denali, which can be confusing. The official name of North America&apos;s tallest peak is Denali, as of August 2015. Prior to that, Mount McKinley was the official name of this peak, although many Alaskans referred to the mountain as Denali (the high one), the original name given by the Athabascan Indians. Days prior to his only visit to Alaska, President Barack Obama officially renamed the mountain Denali. 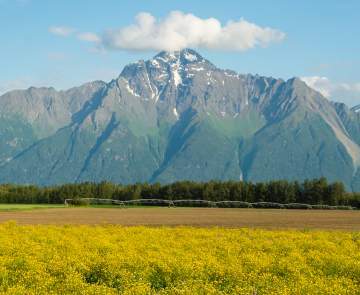 This is North America&apos;s highest peak and understandably one of Alaska&apos;s leading visitor attractions. Stunning views of Denali can be seen on the on the Parks Highway toward Willow and Denali State Park as well as from Talkeetna. One of the best ways to see Denali is in the air on a flightseeing trip. Talkeetna has three flightseeing companies that specialize in Denali flight tours, often including a landing on a glacier high in the Alaska Range. Visitors often indicate flightseeing trips around Denali was the highlight of their Alaska vacation. Situated in the Alaska Range, Denali is in the heart of Denali National Park and Preserve. For more information on scheduled bus trips into the park, visit the National Park Service website. 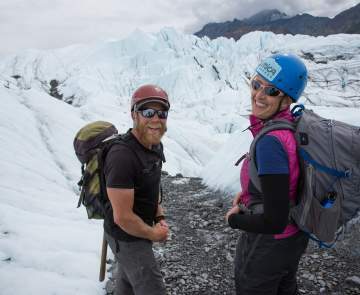 Climbers from around the world come to Talkeetna every spring to begin their ascent of Denali, which stands 20,310 feet. Visitors can find out what it takes to climb this marvel by stopping at the Talkeetna Ranger Station, open daily in the summer. The Talkeetna Historical Society Museum also hosts Ranger talks daily throughout the summer. These free presentations include rangers showing visitors climbing equipment, talking about preparations and routes, and giving visitors a glimpse of the physical demands it takes to climb the mountain. About 50 percent of the climbers reach the summit in an average climbing season, which lasts from mid-April to early July typically. Visitors can call (907) 733-9127 for current climbing statistics, courtesy of the National Park Service.